Coast utilizes chip-on-board (COB) LED technology on their black and gray FL13 Dual-Color Utility Beam COB LED Headlamp to outfit it with 54-lumen low and powerful 250-lumen high white outputs and solid or blinking red outputs to give it a versatile usability that is perfect for just about any job that requires you to have abundant light while keeping both hands free. 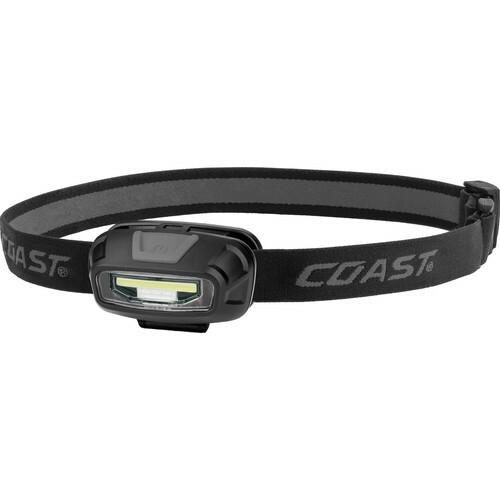 The white outputs are ideal for general jobs or tasks, while the red illuminates without affecting night-adjusted vision, optimizing it for camping, hiking, or astronomy. Its white light Utility Beam design uses multiple smaller white and red LEDs mounted onto a single board to produce its broad beam design with a brighter and larger center spot of light and a limited and diffused spill—this maximizes the selected output to fully illuminate your work area. A single on/off push button on the top of the light's head controls the access to all outputs for convenient and intuitive functionality. The angle of the light head can be adjusted down for precise beam placement to fully illuminate where you're working. Weighing under 2.5 ounces, the light won't cause neck strain or discomfort while wearing it, and it comes with an adjustable headband to fit heads of all sizes, or to fit over beanies and caps. To withstand inclement weather, the housing is IPX4-rated to be water resistant against splashing water or rain. Comfortable, compact, and lightweight, the FL13 runs on two included AAA batteries and comes ready to use in clamshell packaging. Box Dimensions (LxWxH) 8.4 x 5.5 x 2.4"